Cutty Sark sits in what once was a dry dock. After she was brought to Greenwich in 1954, the dry dock was closed off and the ship is now an appreciable distance from the river. As part of the renovations that were completed in 2012, the ship's berthing arrangements were changed significantly. She is now suspended over what had been the floor of the drydock by steel beams. In addition, the lower portion of the ship was enclosed in a glass and metal structure. As a result, what once was a dry dock is now a building. The main entrance to the building is near the stern of the ship. Inside is a gift shop and counters at which you purchase admission tickets. Walking past a diorama of a Victorian dockyard on your right, you enter Cutty Sark through a door that has been cut into her starboard side. You are now in the lower hold. People who are used to visiting restored passenger ships and warships may be surprised by the lack of features inside the hull. You can see how the planking was attached to the ship's iron ribs but other than that the interior is a long open space. However, Cutty Sark was a cargo ship and in order to maximize her revenue producing potential as much space as possible was devoted to cargo. 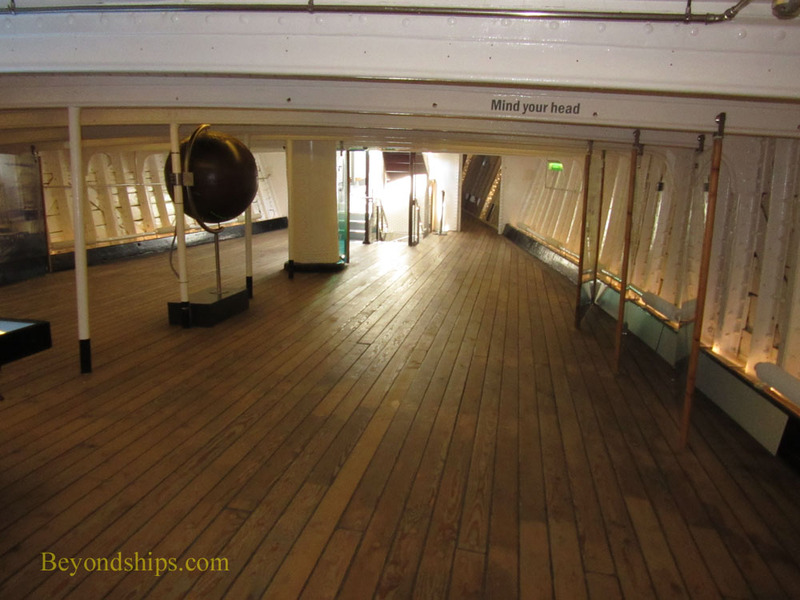 As a result, when Cutty Sark was in service, this deck and one above it were essentially devoted to carrying cargo. The museum has populated the empty space with displays and interactive exhibits telling the ship's story. There are artifacts such as a wind vane cut in the shape of a short night shirt (a cutty sark) and a ship's bell. 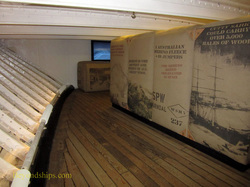 Bales of wool show what the cargo would have looked like during Cutty Sark's days n the Australian trade. Benches that are powered electronically to pitch up and down give the feel of what it must have been like when Cutty Sark was at sea. 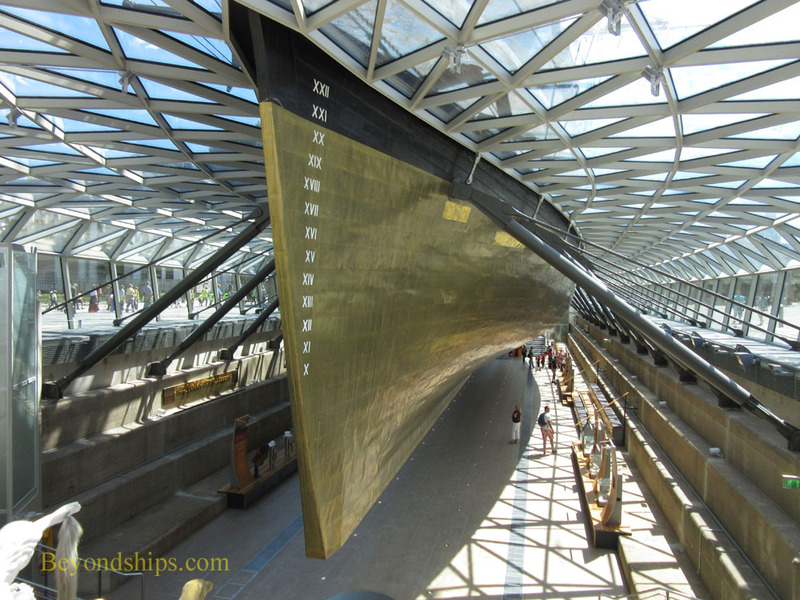 Cutty Sark comes alive when you reach the open main deck. This is where her people lived and worked and an effort has been made to present these areas as if the crew had just gone ashore. There are deck houses showing where the crew slept, the galley where the meals were prepared and the shop where the sailmaker repaired the fabric that power the ship. At the stern is the great wheel that maneuvered the ship. Near the wheel is the entrance to the senior officer's area. The captain's cabin is the largest on the ship but somewhat spartan by today's standards. So too are the cabins of the first and second mates, which are in the same part of the ship as the captain's cabin. Between these cabins is a large room with beautifully polished mahogany paneling. Most of the floor space is taken up with a highly polished wooden table. There the captain could roll out the navigational charts and do other work. This area could also be used for the officers' meals and for entertaining visitors. 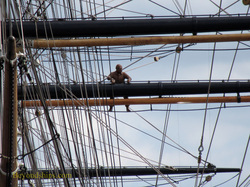 Looking upward from the open deck, you see the intricate pattern of the ship's rigging. These lines and pulleys controlled the mountain of sail that hung from Cutty Sark's three towering masts. A human figure has been placed on one of yardarms to give an idea of what was involved in unfurling the sails. Just the height of his precarious foothold is intimidating. But add the fact that the ship would have been swaying and pitching while he was working and what was an everyday task for Cutty Sark's sailors is revealed as heroic. Alongside of Cutty Sark is a structure that houses an elevator and stairs. This takes you down to what was the floor of the dry dock. 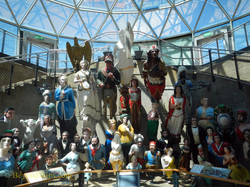 There you will find a cafe at one end and a large collection of figureheads at the other. But, what is particularly interesting about this area is that you can walk under the ship's hull. Steel beams project out from either side of the dry dock to hold the ship suspended just a few feet above your head. Looking up you can see the curve of the copper sheathed planking and the knife edge bow. Like a Grand Prix racing car, the shape virtually cries out speed.